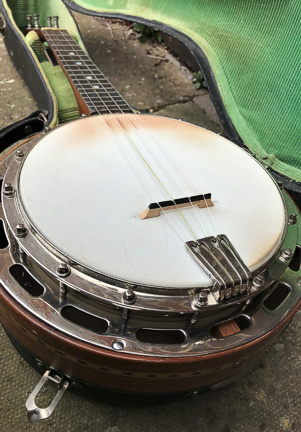 Ludwig 'Wendell Hall' ukulele-banjo SOLD! refurbished about twenty years ago, and still in great condition. Well set up, with powerful tone and easy playing action. Some crazing on the peghead finish, but nowhere else. Mother-of-Pearl inlays added to the peghead, and an attractive wooden inlay around the resonator. Original tuning pegs in great shape. Also, the fingerboard is good. The pictures give an appearance of some wear, but actually it is more a fading of the ebony colour rather than indentation. Original Ludwig case included, in remarkably clean condition (badge missing).